A decade after the release of his first book of Manx piano arrangements, well known piano teacher and composer Frank Woolley has published the second in the series. 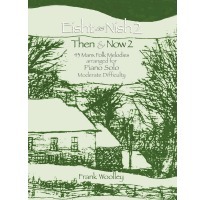 Eisht as Nish 2 (Then & Now 2) contains 43 traditional Manx melodies, including airs, dances, hymns, sea songs and carvals. The melodies were collected during the late 19th and early 20th centuries by the Gill brothers, Dr Clague, A.W. Moore, P.W. Caine and Mona Douglas. This new volume includes arrangements of such tunes as Baase Illiam Dhone (Death of Illiam Dhone), Arrane y Chlean (Cradle Song), Ny Kirree fo Niaghtey (The Sheep under the Snow), Mylecharaine, Brig Lily, Berrey Dhone and the well-known revivalist hymn The Good Old Way. Frank has been teaching piano for 35 years, but has been composing music since the age of 12, when he was a chorister at Lincoln Cathedral! His formal commissions have included ‘A Manx Suite’ for the Manx Youth Orchestra, choral test pieces for the Royal National Festival of Scotland (‘The Mod’) and ‘Celebration March’ for the 150th anniversary of Ramsey Commissioners. He has arranged many traditional tunes for Culture Vannin publications, most recently contributing to ‘Celebration & Contemplation’, Manx Traditional and Original Music for Church Organ. Two of these pieces, ‘Haste to the Wedding’ and ‘Prelude – Manx Fishermen’s Evening Hymn’ were premiered at the Cathedral, Peel by Dr Peter Litman during Yn Chruinnaght, July 2017. Frank has been an official accompanist for the Manx Music Festival for 24 years and is the regular accompanist for the Cushag Choir and Ramsey Choral. Of his latest collection for piano, he said: ‘I hope to have brought out the individual character of each tune and presented it in a way that suits the instrument and is enjoyable to play’. Eisht as Nish 2 (as well as a new printing of the first Eisht as Nish from 2007) is currently available from the Lexicon Bookshop (Douglas), Bridge Bookshop (Ramsey) and Presence of Mann (Laxey Woollen Mills). Or email for direct sales.